Rosacea is a very common disorder that affects the skin of the face with flares that wax and wane in severity. The condition can be mild, with only a light pink color on the cheeks and nose, or very severe and deep red. Very severe cases may have papules, pustules and broken blood vessels especially over the cheeks. Rosacea can also affect the eyes, causing itching or dryness. Over many years, the condition can also cause a thickening of the tissue across the nose. This particular condition is referred to as rhinophyma. Frequently, people will experience multiple forms of the symptoms described above. A genetic predisposition to the condition is most likely. They also may have other contributing factors, such as over-reactive facial blood vessels, inflammation of the skin, and increased reaction of nerves that respond to triggers such as spicy foods, alcohol, exercise, or weather. An association with the demodex mite, which commonly lives on human skin, has been found to exacerbate rosacea. 1. Chronic pink or rosy colored skin affecting the cheeks and nose. 2. Small blood vessels on the cheeks, which are broken and plainly visible. 3. Facial flushing of the skin, which occurs after triggers such as sun exposure, alcohol or spicy food consumption, warm drinks, exercise, wind, and warm temperatures. 4. Small pink papules and/or pustules form on the cheeks. 5. Enlargement of the nose or skin texture changes. 6. Redness, dryness and itching of the eyes. There are many effective treatments for rosacea. Some common topical medications include metronidazole, azalaic acid, ivermectin, or sulfur-based products. Oral antibiotics are commonly used, such as doxycycline, especially when papules and pustules are present. Redness and broken blood vessels are much more difficult to treat with medications. A topical medication that was originally designed to treat glaucoma can be used, providing temporary relief by blanching the superficial blood vessels. This medication, called Mirvaso, is very effective for some people but, unfortunately, not all patients are responsive. Frequently, laser therapy is warranted to treat both redness and the broken blood vessels. Lasers provide a longer-lasting relief from the symptoms of rosacea. They are capable of breaking up the superficial broken blood vessels, as well as decreasing the inflammation of the cheeks. An acute awareness of the symptoms associated with rosacea, as well as the triggers that can exacerbate the condition, is tantamount to successful treatment. The National Rosacea Society has a wealth of knowledge for both clinicians and patients. The website should be utilized to further education concerning this very common condition. Darrel Arthurs's passion for dermatology developed while he was serving in active duty in the U.S. Navy. Since then he has accumulated over 11 years' experience in medical and surgical dermatology. Currently he works independently in a small city in northeastern Oklahoma. Arthurs is on the NADNP Board of Directors. Warts that form on the sole of your feet are called plantar warts. Essentially, they are the same as warts that are found on the hands and knees except this strain forms on the bottom of the feet. The human papillomavirus (HPV) is the cause of these growths, and they thrive in warm and moist environments such as public showers and locker rooms. These warts can be painful since they grow up into the foot and put pressure on the nerves. Warts start life as tiny black dots and grow larger, usually about to the size of a pencil eraser. They are very tenacious and difficult to treat, frequently reoccurring despite your best efforts to eradicate them. Over the counter topical wart removers can be purchased relatively inexpensively and applied on a regular basis. Gels, pads, or liquids can be utilized. My personal favorite is Duofilm 17.5% SA, which costs around $9.00 per bottle. Some brand names include Dr. Scholl's wart remover, Compound W, and Wart-Off. Be sure to follow the directions for whichever brand you choose since these medications' mechanisms of action are to burn the skin. To improve treatment, soak the feet in warm water for approximately 5 minutes prior to applying the medication. Duct tape can be used to treat warts, but it leaves a terrible, sticky residue and takes months of treatment to reach clearance. However, it is economical and can easily be done as a home treatment. Just apply the duct tape to the wart and ensure that the entire lesion is covered with no air reaching the wart. Leave the tape in place for 6 days without removing it. Then remove for only a short period of time to clean off the surrounding skin then immediately re-apply the tape. Continue with the tape until the wart is completely gone with no bumps felt across the area. It would not be unusual for this treatment to take months—possibly up to 9-12 months of treatment to completely clear the wart. Cryotherapy is a safe and effective treatment as well but must be performed by a qualified healthcare provider. This treatment is still covered by most insurances and is the most common treatment in the dermatology office. The drawbacks include multiple treatments as well as pain at the time of treatment. Liquid nitrogen is an immediate frostbite to the skin, and it can sting quite a lot at the time of application. Afterwards, a blister will form and may cause some further discomfort depending on the amount of walking the patient has to do. Most importantly in treating warts is to always be persistent in application. Missing one day of treatment can allow the wart to regenerate and start to grow again, so persistence is the key to success. As you can see from the methods utilized we are not actually killing the virus with treatment but instead destroying the surrounding tissue that allows the virus to grow and replicate. Therefore, daily treatment or very frequent treatment without breaks is the key to success. Frequently, women develop extra hair growth on the face, especially around their mouth and chin area. It can also occur on the breasts or even the lower portions of the abdomen. This hair growth is frequently referred to as hirsutism and can develop in the teen years, or more commonly, as a middle-aged adult or older. These hairs have become the bane of many women, since they tend to multiply and become darker and thicker over time. Frequently, women will come into the office and ask how to get rid of these hairs. Unfortunately, there is not an easy answer, and most women don't like the responses they hear. Even so, a few things can be done to decrease the occurrence and improve the appearance of these hairs. There is actually a great deal to learn about hirsutism and its cousin, hypertrichosis. The science of these conditions, along with the proper way to evaluate for hormonal imbalances, including labs, signs, and symptoms, will be discussed at a later date. Today the focus is on the cosmetic issue of these hairs and some ideas that may help patients to be less insecure about them. The first method is tweezing, which is perfectly fine. Once the hair is removed it will take time to grow back since you are removing the entire hair bulb and all. Another method is shaving—which I am not a fan of. No current studies, which I am aware of, exist that indicate shaving actually makes the hair grow in thicker, but from my experience that's what happens. I usually recommend shaving as a last resort and only at the minimum that it must be done. Electrolysis and thermolysis have both been used for many years to help with hair removal. There are multiple types of treatments with these machines—some of them more effective than others. The drawbacks to this type of hair removal are the time required to treat and the length of treatments. Usually, the treatments are weekly with a time commitment of one to two hours and may last up to five years or more. The cost of these treatments can add up over time, which is why this procedure is best used in small areas only. A topical medication exists for hair removal. It is a prescription and runs about $120.00 per tube, taking 4 to 8 weeks to show effectiveness. The cream must be continued or the hair growth will redevelop. For very small areas, this may be a good treatment plan, and I have several women who come in yearly to get refills. They say the tubes last about two months before they need refills. Laser hair removal has gained a great deal of attention over the past few years and become much more mainstream in treatment. It is effective for most people and will remove the hair for up to six months after two to six initial treatments. At this time, there are companies selling handheld laser hair removal devices. These are still new and have not been thoroughly tested as to their reliability. The cost of laser hair removal is decreasing in many areas as more and more demand increases the supply. Some of the lasers will treat multiple areas such as the back, bikini, chest, face, neck, and shoulders. It must be noted that laser hair removal is only useful for thick, dark colored hairs and not fine vellous (peach fuzz) hairs. The method of action for the laser is to follow the color of the hair into the hair follicle to destroy the bulb. 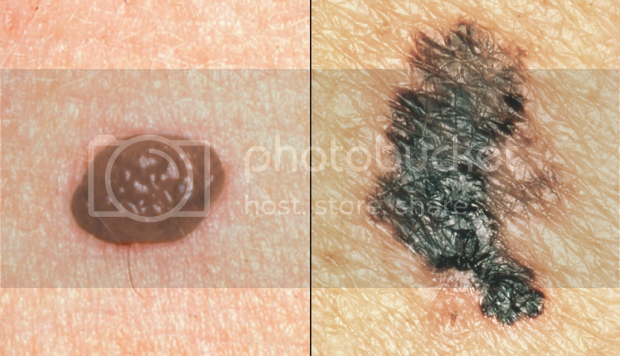 Melanoma is the most lethal of all the skin cancers. 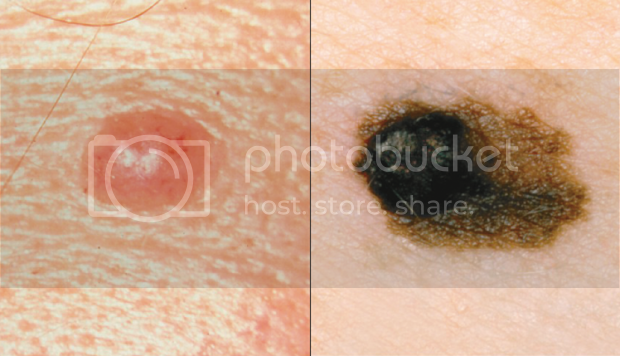 It is estimated that melanoma kills 10,130 people annually in the United States. Many of these deaths could be easily prevented with proper screening and catching the cancers in their infancy. These skin cancers are highly survivable if found early—before they are able to metastasize and affect internal organs. Being aware of the signs of melanoma is extremely important. Educating patients and their families about the warning signs of melanoma can extend life or possibly even prevent early death. The ABCD&Es of melanoma are an effective method to educate our patients about the warning signs of melanoma. A—Asymmetry. If a mole has one side that is larger than the other it is asymmetrical. An easy way to assess this is to draw an imaginary line through the center of the mole and compare the two sides. If one is larger than the other the mole is asymmetrical. B—Border. Most benign moles have smooth borders that are even. Melanomas tend to have borders that are not smooth but instead uneven, possibly with scallops or notches. C—Color. 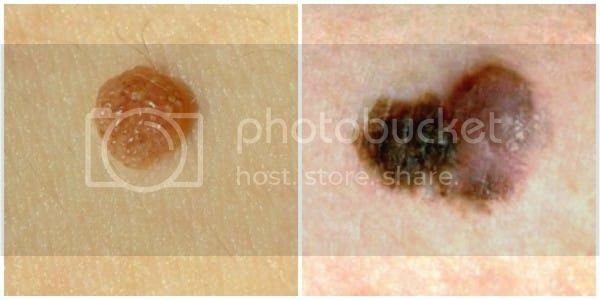 Benign moles are usually all one color often a shade of brown. 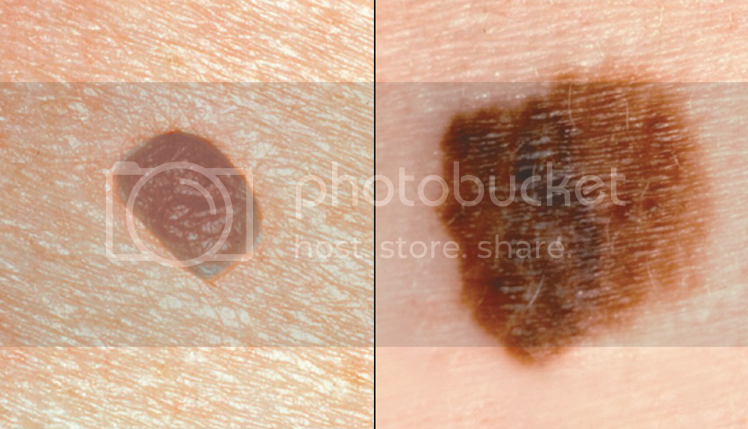 When there are two or more colors present, the mole is a warning sign of melanoma. Secondary colors are frequently black, tan, red, white, or blue, as well as some deeper shades of brown. D—Diameter. Normally benign moles will be smaller than 6 mm in diameter (the size of a pencil eraser), but melanomas frequently grow larger than this. While some moles that are benign can be this size or larger, most are not. The size of the lesion can be another warning sign. E—Evolving. A typical benign mole will look the same over time with only minor changes occurring. Changes such as size, shape, color, elevation, or any other changing trait can be a warning sign of melanoma. In addition, symptoms such as burning, bleeding, itching, or crusting can indicate the need for further evaluation or possibly even biopsy. Last month we discussed Seborrheic keratosis (SK)-those rough growths that develop on the skin of people who are becoming more mature. In-office treatments were reviewed, and now this month we will evaluate some home remedies that will help with these irritating growths. The best treatment is alpha hydroxy acid (AHA) and-more specifically-glycolic acid, because it is proven to be effective in loosening up the dead skin cells. This acid will remove the glue that holds the old dead cells in place from the upper layer of skin. By doing this, glycolic acid will enable new skin cells to grow in more effectively. This new growth has been equated with decreased SK thickness as well as helping with fine lines and wrinkles across the face. In addition, it causes compacting of the deeper skin cells, which will give the patient a more polished appearance. Glycolic acid is found in many cosmetic lotions and creams on the market today. The Food and Drug Administration will allow companies to use glycolic acid in concentrations of 10% or less in lotions and creams. The exception to this is facial peels, which are dosed up to 50% and even 75% in a step-wise treatment regimen. Conditions treated with chemical peels include acne scars, a dark pigmentation across the face called melisma, as well as wrinkles and sun-aged skin. Side effects of glycolic acid are minimal, the main one being increased sensitivity to sunlight. Therefore, always apply sunscreen-SPF 30 or above is recommended-after using and when outdoors. Without advocating for any one particular product, we will review a method to decrease SK across the body. To begin, use an exfoliating sponge or cloth in the shower or bath to those areas that are forming these growths with a body or bath wash containing glycolic acid. Some common places these barnacles like to grow are the face, backs of the hands and knees, as well as the top of the foot. Start at two times per week to allow skin to get used to the quicker-than-usual exfoliation, then slowly increase to nightly. Be particularly careful across the face and neck since these areas are more sensitive. Within 3 to 4 minutes after toweling off, apply a lotion containing glycolic acid to all of the skin. For the remainder of the five days, use a thick, rich, non-scented body cream or lotion after showering. An exfoliating sponge or cloth can still be used in the shower on those other five nights. Over time the skin will adjust to the treatment. When it does, increase the nights per week that the glycolic acid lotion is used. Over time, a significant decrease in the roughness of those barnacles as well as increased skin softness and fullness will be noticeable. Remember, it is important to never use exfoliation or any acids on open sores or broken skin. Dermatology professionals should evaluate any sores that won't heal or any new growth that does not go away. Please contact me via Facebook for some specific products to use if you are interested: Darrel Arthurs, NP-BC Dermatology Certified. Over the years, I have seen many people in the office asking about crusty Seborrheic keratosis (SK). These scaly, popular, bumpy growths occur on most people who are middle-aged or older. They are odd looking, with varying colors and configurations. Scale can come off them, and they frequently catch on clothing and get irritated. 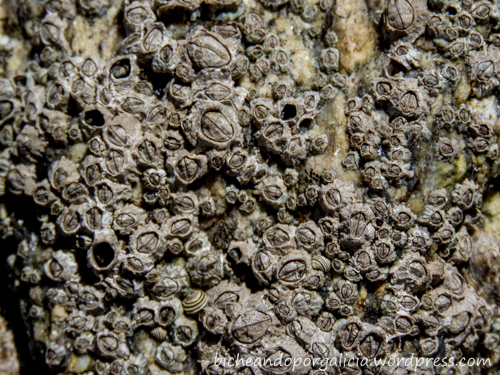 When I first started working in dermatology, a little old lady called them barnacles, because they resembled the growths that occur in the ocean. SK's of the body are similar to warts in structure in that they are made up of extra layers of skin cells, which are both living and dead. Since SK's are made up from your own skin layers, it indicates that some skin care products can help to alleviate these growths. Also, a few skin care tips can be taught to help decrease or even completely remove these growths. SK's begin to form on many people after the age of 30. There is no predilictation to male or female. Both sexes are equally affected; however, there is a genetic predisposition to getting large numbers of growths across the body. These growths all have a stuck-on appearance and feel that way as well. Frequently they are darker than the surrounding skin, but they can be skin colored, yellow, gray, light brown, brown, mixed or even red. SK's can form on any part of the skin not just in the seborrheic distribution of the body, such as the scalp, mid-face, chest or upper back. SK's form because your skin grows excessively, and it develops a little mound or papule that is raised higher than the remainder of the skin. The papule is made up of living cells as well as excessive layers of dead skin cells, which is called the stratum corneum. This is why they have a crusty appearance and feeling as well as appearing stuck on, like a barnacle. In-office treatment for SK's includes liquid nitrogen, which is used on thinner lesions. Occasionally, these lesions will need to be treated on a repeat basis until resolved. Curettage or scraping off the lesion with a sharp circular blade (curette) can be done, as well as a shave biopsy of the lesion. Electrocautery as well as ablative laser surgery can be used to treat some lesions that are not too large. Intralesional lidocaine will need to be used for all of these procedures. Finally, chemical peels may be beneficial some thinner lesions as well. Many of these procedures are not covered by insurance any longer since SK's are benign growths. Often, patients will need to pay cash for the removal of these lesions. SK's can be irritating to patients and adversely effect their lives. Frequently, patients will ask if there are home remedies, which can be done to lessen the severity of these lesions. Since SK's are stuck on to the surface of the skin, the key to treatment is exfoliating with physical buffing and to use alpha hydrox acid (AHA) products, which will soften and frequently entirely loosen these growths. We will touch on these home remedies further in the next blog.